Ex-President Jimmy Carter has announced in a statement that his brain cancer is gone. “My most recent MRI brain scan did not reveal any signs of the original cancer spots nor any new ones,” Jimmy Carter, 91, said. The former president first announced the news during a Sunday school class in Plains, Georgia. Jimmy Carter, who was president from 1977 to 1981 and won a Nobel Peace Prize in 2002, revealed his illness in August. Last month, Jimmy Carter said he was responding well to treatment and there were no signs of further cancer growth. Jill Stuckey, a member of the congregation at Maranatha Baptist Church in Plains, told the Atlanta Journal-Constitution that Jimmy Carter had been teaching the class of about 350 people when he made the announcement. Jimmy Carter revealed in August that cancer initially found in his liver had spread to four spots on his brain. The lesion on his liver was removed on August 12. After leaving the White House, Jimmy Carter founded the Carter Center, which focuses on human-rights efforts and political mediation. He has remained active with the center ever since. 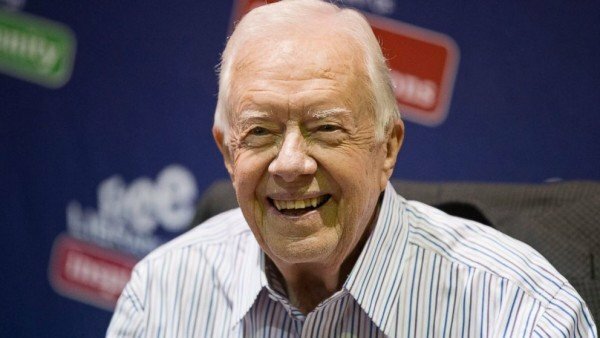 Jimmy Carter – a Georgia Democrat – won the Nobel Peace prize for his commitment to finding peaceful solutions to international conflicts and his work with human rights and democracy initiatives.